Before you choose paint, see how color tricks fool the eye and can make certain colors difficult to judge. One of the indelible moments I took away from my design-school color theory class were color tricks — illustrated by the concept of simultaneous contrast. Without getting too technical about a complex subject, the idea is that color is not absolute when we see it. The appearance of a color — especially colors which are mid-range and muted – the can change with various combinations. The reason? Our eyes mix colors automatically. This is particularly true of muted colors, which contain some black, and are neither very pale nor very dark. That can include lavender, muted sage greens, certain beiges, blue-grays and especially yellows. This visual trickery is one reason someone with some color knowledge will never recommend painting swatches of different color paint swatches on a wall. Additionally, it’s a reason certain yellows as well as lavenders and greens are especially prone to change along with light in a room. My favorite way to illustrate the principle of simultaneous contrast is by showing a study I did [top] with color-aid paper. How many different colored papers were used in these two collages? If you guess four different colors – two different backgrounds and two different centers – you are wrong! Only three different paper hues were actually used. The small center squares were cut from exactly the same piece of paper. 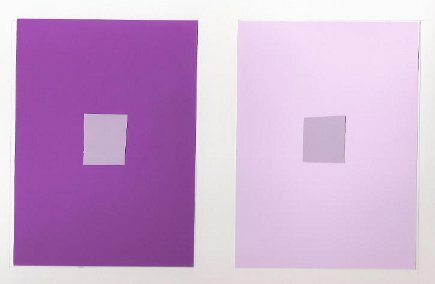 Yet the square set against the fuchsia background appears far lighter than the very same color appears on the pale lavender background. This is a result of the interplay of colors as our eyes see them. The visual trickery occurs because an intense color such as fuchsia pushes the center square to appear lighter while against the less intense lavender background the square appears darker. This video (kindly excuse the cheesy music) shows the very same principle in action. And how that ‘awful’ paint chip took me by complete surprise and turned out to be the best color for my kitchen.